On the occasions that I help my mother get Coffee ready, I find myself thinking of the horse I met two and a half years ago. I suspect that his breeder and trainer would be very disappointed to see what he’s become. Yet, for me the transition makes me smile. A recent interaction left me laughing, and confirmed even further just how much he has changed. But before I explain, let me introduce you to the two Coffees. The first thing that struck me when I met Coffee was his lack of reaction to the humans around him. He didn’t appear to be an unhappy horse – just a disinterested one. When the door was opened to his stall, he didn’t even flick and ear. He was facing the corner, munching on hay. 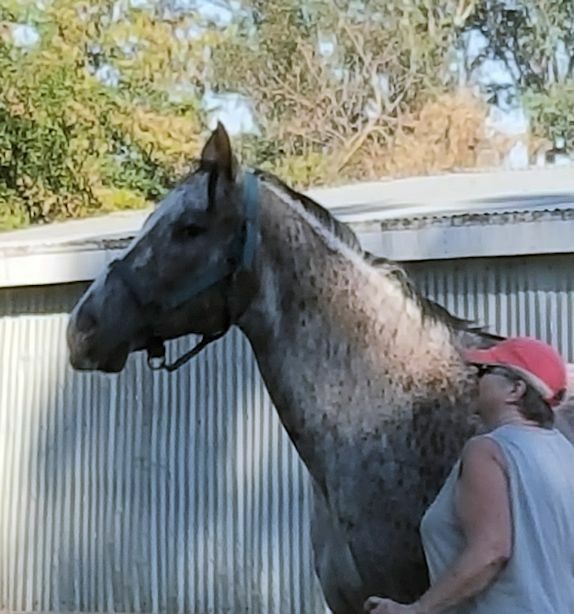 He stood quietly while the person approached, and was polite about getting his halter on – but he never once looked at the person or reacted to them in any way. Coffee dutifully followed the person to the grooming area – no lead rope needed. Once in the grooming area he stood without moving a muscle. He picked up his feet at just a word, and when the person was done he made no move to put the foot down. The people were insistent that every horse allow them to place the hoof back on the ground precisely where they wanted it – which was always perfectly square. I know that Western barns have a reputation for over-managing their horses, but this was beyond anything I’d imagined. Throughout the grooming, there was something about his expression that puzzled me. He was not exactly dull or tuned out … but I had never seen anything quite like it. Then a metaphoric image flashed in my mind – he looked like an active young child, dressed in his finest suit, who has been told to stand perfectly still. There was an unnatural concentration and discomfort in his expression and posture. It seemed an excessive effort to be put into something as simple as standing to be groomed. I tried to interact a bit, but it was clearly frowned upon in this barn … and he didn’t know what to do with it anyway. I was concerned that he might not be “friendly” enough for my mother – but I felt a compelling need to take him out of this over-managed environment. The next morning, before I loaded up for the long trek home, we turned him out to play with his brothers. It was the first sign of his natural personality – here was the kid on the playground who runs up and slaps another kid just to get them to chase him! A glimmer of hope that there was a more interesting horse inside that frosty hide. This is the fully interactive version of Coffee. He greets us, physically and verbally, when we enter the barn. 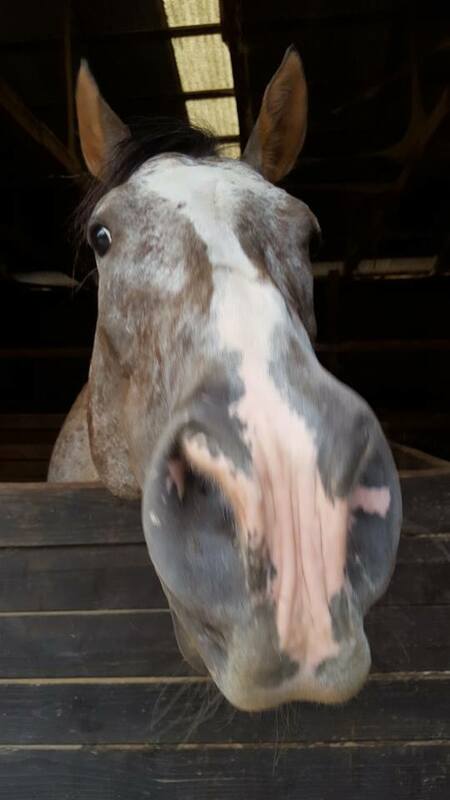 Each time one of us walks past his stall, he pokes his nose in our direction, hoping for a scratch, face rub, or tasty treat. Even when he has his hay, he’ll stop to poke his head over the stall to watch whatever we’re doing. Sometimes, when I’m watching his bucket fill with water, he’ll come over for a cuddle. When we go to get him out of his stall, he’ll meet us at the door, and poke his nose toward his halter. As we groom him, he’ll give a friendly nuzzle as we pass by his face. Of course, it’s not all “happy, happy, joy, joy!” … try to turn toward the cross-ties, when he’d prefer to go out grazing, and we get an immovable Coffee whose entire expression says “You have made an incorrect choice!” But that’s just the point – every moment spent with Coffee is a dialog! Which brings me to a couple of days ago, when I was making the rounds with the hay. I found a small piece of alfalfa and carried it to his stall. He pressed his nose to it, took a couple of deep sniffs, then chomped a large mouthful and happily munched away! “Spoiled brat!” I laughed, as I tossed the piece into his stall. I can understand the appeal of having a horse that is unquestioningly obedient. They are very large, and therefore potentially dangerous without even trying. But I don’t want a recreational vehicle – I want a partner. Successful partnerships require that both partners have a voice. Partnerships require occasional negotiation and compromise. Of course, the relationship with a horse can never be a 50/50 partnership – just the need to contain them for their own safety dictates that. But even a “junior partner” gets a say now and again. So, we’re happy with the upgrade to Coffee 2.0 – even when we occasionally get feedback we weren’t looking for! It warms my heart to see a relaxed, self-confident, expressive horse who no longer has to suppress his natural personality. And he’s clearly won my mother’s heart! Be good to your horses … and let their personalities shine! This entry was posted in My Journey and tagged Coffee, dialog, ground manners, Horse training, partnership, personality. Bookmark the permalink. That’s what I truly enjoy too, finding their real personalities! I had certainly never heard anyone insist that the horse could not put their own foot down! They were very nice people, but it was a foreign world to me!